Louisiana Sen. Mary Landrieu is locked in a runoff election that she has little chance of winning. She has abandoned Democrats in an attempt to save her job. Landrieu gave a three hour floor speech in support of the Keystone XL Pipeline and has finally gotten a commitment for a vote this year from Harry Reid. Afterwards, she blew off Chuck Schumer and wouldn't even speak to him. If she had done these things a years ago, she wouldn't be in the runoff. I doubt Louisiana voters will be impressed by her sudden change. “I don’t think we necessarily need to wait until January,” she said Wednesday in a floor speech that lasted almost three hours. 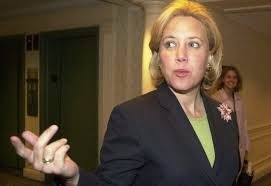 Landrieu made no attempt to hide her motive. “I’m going to do everything in my power here and at home on the campaign trail, where I’m still in a runoff, as you know, to get this project moving forward,” she said. And later, she secured an agreement from Democratic and Republican leaders to hold a vote authorizing the pipeline as early as next Tuesday. House Republican leaders also announced plans to hold a vote as early as Thursday to authorize the pipeline, the ninth time the GOP-controlled House has voted to approve the pipeline in the past six years. Before her remarks, Landrieu was spotted riding the escalator alone up from the Senate trains that carry lawmakers between their offices and the Capitol, toward a row of elevators. She was stone-faced and declined to answer questions from reporters. Once she reached the top level and stepped off, Sen. Charles E. Schumer (D-N.Y.), one of his party’s top campaign strategists, walked over. Smiling, he asked Landrieu to step aside for a private conversation. She shook her head and moved briskly toward the elevator. As she did, she pointed to her phone, saying she had a call. Schumer paused for a moment as she moved away. His smile dropped, and he turned to follow her. “Mary, Mary,” he said, a few steps behind, asking her to speak with him. When she kept moving and ducked into an elevator, he hustled and jumped in to join her as the doors closed.